Honestly this place has some of the worst pizza I have ever eaten. 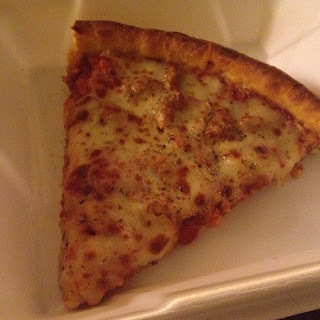 Reggio's offers more than just pizza... but if their wings, fish, or other random menu items are like their deep dish or thin crust pizza (sorry not pictured), then the food must be horrible. The staff is not very friendly and they have a minimum of $8 charge I believe on their credit card machine. Also, I once charged at this place, and somehow a $5 tip was shockingly added to my $8 credit charge. It is a ridiculous restaurant and I wonder how it is still open. Don't eat here please. Well, if you want to try deep dish pizza from Chicago, DO NOT come to this place. I can't believe I have eaten here more than one time, and each time, I regret it. The so-called deep dish pizza has a super thick and tough crust. It has little bit of tomato sauce and a cheese that hardens to rubber-like consistency. There seems to be an oily film on top of the cheese. This particular piece for sure had sausage which wasn't seasoned too well. I covered it in crushed red pepper just to give it a better taste. The only plus side is it costs $5 for the slice with a can of pop. My suggestion is walk to the 7-11 across the street and buy chips, taquitos, and a coke. It is a much better decision. I actually forgot if the picture above was sausage pizza also or if it was cheese. But anyway, it was absolutely horrible like I mentioned in the above description. The only reason I ate it was because I was nursing a hangover and it was the closest place to grab food that didn't involve waiting and it came with 7up. The 7up was the main selling point because it settles the stomach. - Don't eat here... Thanks!